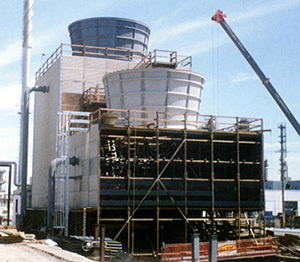 Ecodyne Cooling offers a complete line of cooling towers and Aftermarket service. From large field erected process cooling towers to small factory assembled packaged cooling towers, Ecodyne Cooling can support your cooling requirements. Our Aftermarket service covers a broad range of cooling towers, regardless of who originally supplied your tower. Performance upgrades, structural reconstruction, maintenance contracts, mechanical overhaul and component replacement are all services Ecodyne Cooling provides to a wide range of owners / operators. Ecodyne uses the best structural materials available to provide your tower with the longest possible service life, the lowest possible maintenance cost and the maximum possible performance. We’ve been in the cooling tower business for nearly 60 years. These long years of experience in the design, manufacture and construction of new towers, coupled with our extensive experience in the repair and upgrading of virtually every make and model cooling tower, have enabled us to field test the performance characteristics of a large variety of structural materials and components. 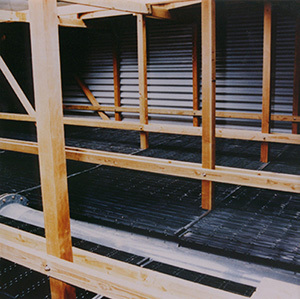 As a result of this experience, we use only those materials proven to function best in the unique and demanding cooling tower environment. Fans, Gears, Couplings and Motors are designed for years of efficient performance. Like everything else we put in our cooling towers, our mechanical components were designed and selected specifically to provide our customers with many years of energy conservation, low maintenance and highly efficient operation. Whether you need to replace a single part or change out an entire system, we can supply the components best suited to your application. Each year your cooling tower performance degrades a little. In time, this degradation becomes a measurable level of the tower’s design capability. 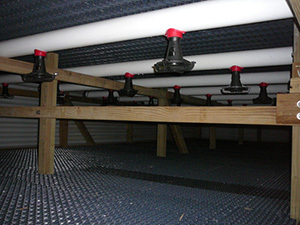 Replacing key components with modern Ecodyne parts can return your tower to its original capacity. Whether robust splash fill arrangements or highly efficient film fills, including clog free products, Ecodyne can provide a solution to suit your unique operating conditions. Conserving water, reducing chemical consumption and controlling damaging drift, all while minimizing static resistance is the challenge for your drift eliminators. Older style drift eliminators can easily be upgraded with state of the art high efficiency drift eliminators providing maximum drift removal rates and minimal static resistance. Improved methods and materials in supporting and sealing the drift eliminators around structural members further enhance the installation. Opaque fiberglass sheathing remains the material of choice for the exterior walls. Impervious to biochemical attack, a leading cause of deterioration in older wooden components, fiberglass walls can be specified in a wide variety of profiles and thickness to suit your specific requirements. Ecodyne thermal and water distribution components are not general purpose, dual use, off the shelf items adapted for cooling towers. Our spray nozzles are designed specifically for cooling towers and the types of fills used in these towers. Of greatest importance is matching the required spray nozzles with the fill to ensure optimum water distribution and maximum efficiency.